Over a thousand kilometers away from Istanbul lies a small village nestled in the northern Lebanese region of Akkar that is named Kaweishra. This village symbolizes the last remaining outpost of Ottoman linguistic presence in Lebanon where the inhabitants speak Turkish, and their streets are dotted with Turkish flags. 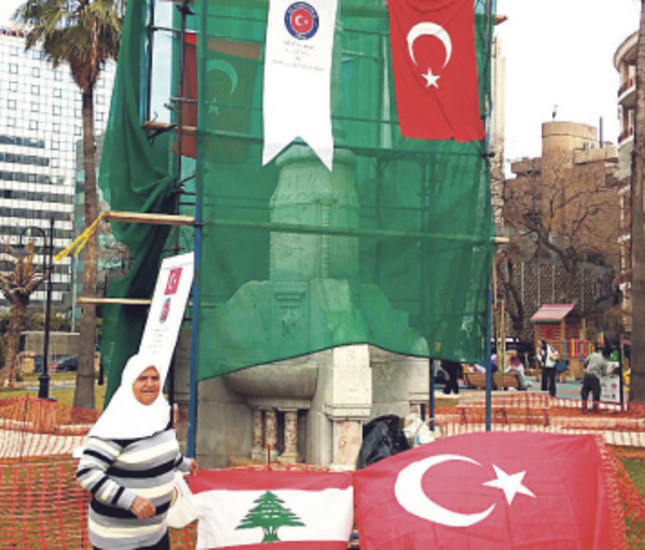 Yet with the recent rise of Turkey under the Justice and Development Party (AK Party), Turkish flags have extended far beyond Kaweishra well into major Lebanese cities, most notably Tripoli and Saida. Amid the security deterioration, rising poverty levels and political impasse that Lebanon is going through, Turkey offers a relationship that is surely worth enhancing. Turkey's growing economic clout in the region has been noteworthy in light of its gross domestic product quadrupling over the past decade, making it the 17th largest economy in the world. A recent report revealed that over the past 10 years, the poverty rate in Turkey was reduced by 10 percent. It has been able to satisfy its billions of dollars of debt to the International Monetary Fund without the need of crippling austerity measures. Across the Aegean Sea, EU member Greece is eyeing it with envy. With the Syrian economy in collapse, an increase in Turkish trade becomes a necessity as a means to fill the revenue void of Lebanon's ailing economy. A quick look at Lebanon's export partners indicates Turkey barely makes the list. Glancing at Lebanon's import partners, Turkish products only account for 4.5 percent of total imports. In addition to Turkey's economic prowess, the AK Party has brought in a rising and resurgent foreign policy that has maintained consistency and a desire to see a stable Middle East. Due to unfortunate timing, it was in 2010 when a free trade zone was established between Turkey, Syria and Lebanon. It would only be a couple of months later that the Arab Spring would erupt, bringing a tumultuous period to the region with the Syrian civil war being the most catastrophic. The tumult was especially present in Lebanon. As a result, this hampered Lebanese trade with Turkey due to the volatile situation in their shared neighbor, Syria. However, Turkey brings a principled doctrine, one that is non-sectarian, aligned with the bulk of the international community and, in reality, tied to Lebanon's official view of the conflict next door. Lebanese former Prime Minister Najib Mikati made it clear that the government will "stay neutral on the Syrian situation." On the ground this has been far from true, especially with Hezbollah forces entering Syria on the side of the regime of Syrian President Bashar Assad battling Syrian revolutionaries. Continued Iranian interference in Lebanese domestic politics via its proxy Hezbollah and the consequent green light for the armed group to enter Syria has put the country within the Iranian orbit and international condemnation. On the other hand, NATO member Turkey's support for Lebanese institutions, not militias, and a Syrian policy that falls within the realm of international consensus is a policy the Lebanese state must pursue to withstand the radically changing dynamics of the region. Lebanese University Professor Halid Tadmori, who is a member of the Tripoli city council in addition to being the president of the Lebanese-Turkish Society, had much to say regarding the importance of increasing bilateral relations between Lebanon and Turkey. Graduated from Mimar Sinan University with a bachelor's degree and master's degree in architecture and later a Ph.D. in urban planning, Tadmori witnessed the exponential change in Istanbul under then Mayor Recep Tayyip Erdoğan. With respect to Tripoli, Tadmori claims that it has partnered with five Turkish cities, among them Gaziantep, Bursa, Konya, and the Fatih district in Istanbul, under the sister-city framework. Tadmori goes on to explain that the Turkish model with respect to urban planning and beautification of city squares can be implemented in Lebanon. It comes as no surprise that Turkey has become one of the top destinations for tourism, a commodity that Lebanon desperately needs for economic survival. Currently, there is a heated debate in Tripoli regarding the construction of an underground parking lot in the iconic al-Tell Square, once home to an Ottoman administrative building. The Committee for Construction and Development, which is a Lebanese government body, has a long history of unsatisfactory project execution, most notably the Abu Ali River project. Adjacent to Abu Ali lies an Ottoman Mevlevi lodge, which was renovated by the Turkish Cooperation and Coordination Agency (TİKA), and the quality difference between these two aforementioned projects is clearly visible. It is for this reason that Tadmori is pushing for further Turkish involvement in such projects to spur Lebanese tourism. In an assignment that Tadmori conducted for the Turkish Foreign Ministry, he claims that there are about 1,300 Ottoman-era projects throughout Lebanon, many of them in poor condition. Turkey's willingness to renovate these structures should be greeted with open arms. most recently the Orontes River dam in 2011. Turkish ties with Lebanon go far beyond mere export and import statistics. Until today, Turkish surnames dominate many families in Lebanon like Mawlawi, Shalabi, Istanbouli, and Darwish. With Syria, Lebanon's "older brother," going through a popular uprising that seems to have no end in sight, it is time for Lebanon to look toward its other sibling, Turkey, and build a relationship that could help weather the political storms hitting the region.